PROVERBS 15:3 KJV "The eyes of the LORD [are] in every place, beholding the evil and the good." 1A soft answer turneth away wrath: but grievous words stir up anger. 2The tongue of the wise useth knowledge aright: but the mouth of fools poureth out foolishness. 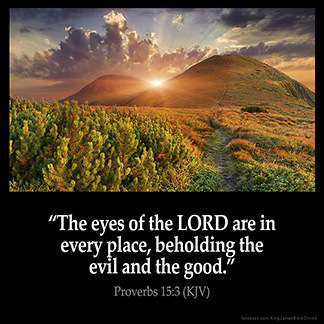 3The eyes of the LORD are in every place, beholding the evil and the good. 4A wholesome tongue is a tree of life: but perverseness therein is a breach in the spirit. 5A fool despiseth his father's instruction: but he that regardeth reproof is prudent. 6In the house of the righteous is much treasure: but in the revenues of the wicked is trouble. The eyes of the Lord are in euery place, beholding the euill & the good. Watching at this time is essential. Know what time it is!